Ba Na is a place with the high terrain, the climate is cool all year around so it is suitable to organize outside activities. Thanks to those advantages, Sun Group Cooperation exploit have exploited all perfect natural terrain of Ba Na mountain to build Golf-court. Opened at the end of March, Ba Na Hills Golf Club was established and become an ideal destination for the talented golf players who want to conquer more new holes and experience high-rank services. Spread over and area of 165 hectares, exploited and managed by Sun group cooperation, this project in the first period has 18 golf holes, 9 lines along tree forests, sand pits, other 9 foot lines crossing hillsides. Coming here, golf players can relax and immerse in the scenery of neglected, occult forest and mountain. 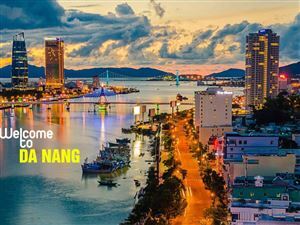 It takes you about 25 minutes to Ba Na Hills from Centre of Da Nang City by cars. 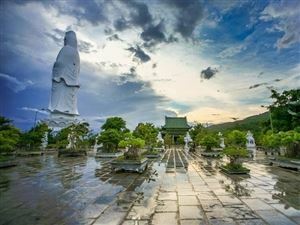 Ba Na Hills is located on the main street of Ba Na - Dream stream. This is a place which has temperate climate year-round so plants and flowers grow well, natural sight-seeings are so fascinated. With many experience years, Luke Donald - a professional golf player designed golf lines on tortuous terrains of Ba Na to issue a challenge for other golf players. Golf players can enter this golf-court freely without membership cards. This place was designed by different tectonic terrains, so it is suitable for both beginners and professional players to perform themselves. This golf-court has 18 carpets for practicing with internationally standardized training areas, 2 skill training rooms, 8 ball pits, 5 wicket areas. Especially, If you are beginners, international trainers with PGA certifications will support and instruct you all times. On carpets, there are Mini Verde Bermuda in Green area and Celebration Bermuda grass imported from America, all these things will help you make ball lines longer through white sand hills, carpets, large view, lakes, brushwood. For people who love romanticism, a brushwood of pink reeds, forests, sand holes or lakes in Ba Na Hills Golf Club surely attracts them. On the other hand, for professional Golf players, this is a hard challenge to do. Coming here, all golf players with different levels will have chances to conquer challenges 72 standard sticks and 7,595 yard (similar to 6,945m). This is a plus mark which makes success and difference of Ba Na Golf club in comparison with other golf clubs. After the time of immersing in nature with golf holes, in the restaurants, you can enjoy delicious dishes from Europe, Asia and Viet Nam to continue conquering golf holes in Ba Na Hills. In front of the restaurant, there is a beautiful and poetic nature scenery of high mountains, pine hills so you can both savour special eating and drinking and contemplate romantic landscape here. To go to golf-court, you can join in a Ba Na Hills tour. 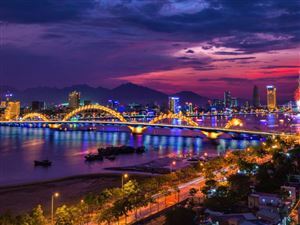 This is a tour of projects of Quang Da Travel - a company about famous consulting tourism, travel transport of Da Nang. 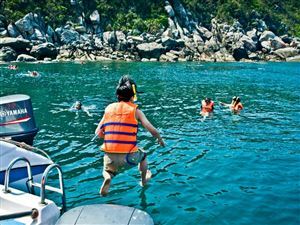 Experiences in many years, enthusiastic staffs, and high quality make successes of Quang Da Travel now. These above useful information which we want to provide for you. Wish you have a happy trip!